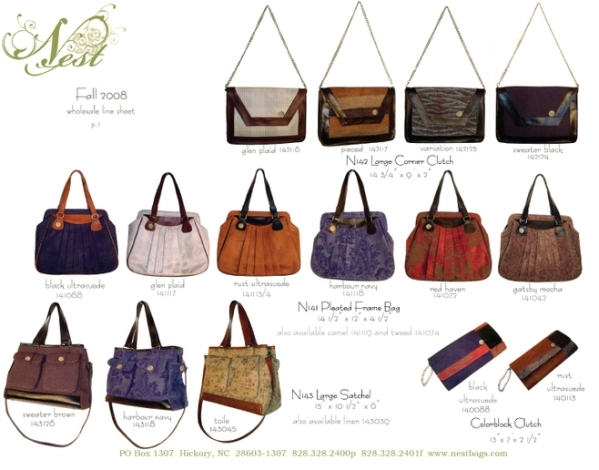 NEST handbags have it all and at a great price point too, from only $85- $200. After 15 years of designing for various other companies, Kim Bost finally pursued her dream of forming her own collection and in 2006 NEST handbags was born. Being true to Everybody needs a NEST tagline, Bost is very conscious of offering quality products at a great value. Her collections comprise of carefully designed handbags, totes, hobos, cross body bags, clutches and wristlets that are easy on our bank accounts as they are to carry around. The exquisite fabrics used and the innovative styles make Bost's collections rare and uniquely fashion forward. Bost also expanded her company with the addition of a small leather and suede collection, makeup bags and slippers, these also use Nests unique fabrics but also they too are affordably priced. Bost's fall collection can easily be worn with the Tweed, modern bohemian and plaid suites and pants We've seen on the Fall runway this season.